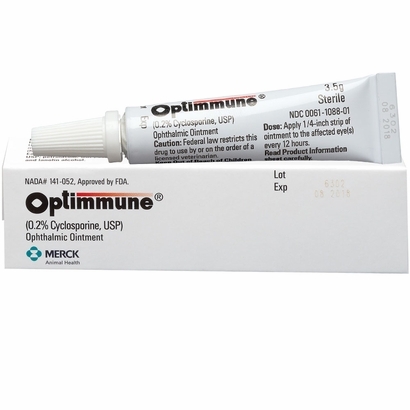 Optimmune is a sterile eye ointment containing cyclosporine which helps to treat keratoconjunctivitis Sica (KCS or dry eye) in dogs. How it works: Cyclosporine has broad anti-inflammatory effects that help to reduce damage to the tear glands while also stimulating tear production. Dosage & Administration: Use this medication exactly as directed by your veterinarian. If you do not understand the directions ask the pharmacist or veterinarian to explain them to you. Wash your hands prior to using the eye ointment. Apply a 1/4 inch strip of the ointment into the lower eyelid. Store Optimmune Ophthalmic at room temperature, away from moisture and heat. Keep the tube properly capped. 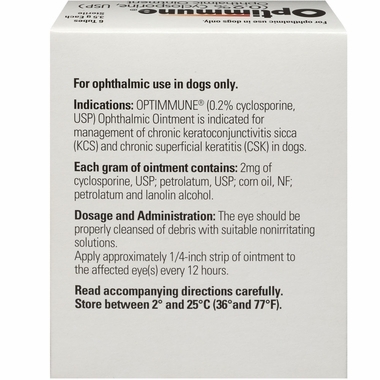 Optimmune Ophthalmic Ointment, a prescription medication, is used in dogs for the management of chronic keratoconjunctivitis sicca (KCS or 'dry eye'). Optimmune Ophthalmic Ointment is an immunosuppressive agent used to reduce inflammation in the eye(s). 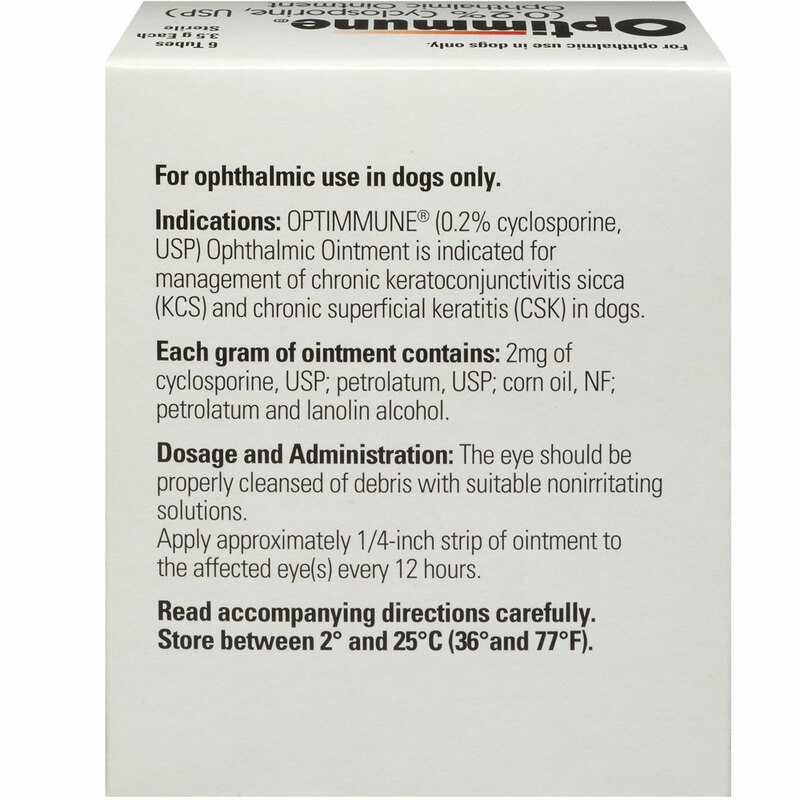 Optimmune Ophthalmic Ointment is used in dogs only. Do not use in cats. Tip: The tube opening is sterile. Do not touch the tube opening to any surface, including eyes and hands. If the opening becomes contaminated, it could cause an infection in the eye(s). Storage: Store this product at room temperature, away from moisture and heat. Keep the tube properly capped. What happens if I miss giving a dose: Apply the missed dose as soon as you remember. However, if it is almost time for the next regularly scheduled dose, skip the missed dose and apply the next one as directed. Do not give a double dose of the medication. What happens if I overdose the pet: An overdose of this medication is unlikely. If an overdose is suspected, wash the eye with water and seek emergency veterinary medical treatment. What should I avoid while giving Optimmune to my pet: Do not touch the tube opening to any surface including eyes or hands. This medication may cause blurred vision. Avoid using other eye medications unless approved by the veterinarian. Possible side effects of Optimmune: Serious side effects are not expected. Some burning, redness, tearing, discharge, pain, itching, stinging, or blurring of the eye may occur. Continue the medication and talk to your veterinarian about any side effect that seems unusual or bothersome to the animal. What other drugs will affect Optimmune: Before using Optimmune Ophthalmic, tell your veterinarian if your pet is using other eye ointment or eye medications. Drugs other than those listed may also interact with Optimmune Ophthalmic. Talk to the veterinarian or pharmacist before giving any prescription or over the counter medicines. What should I discuss with my veterinarian before giving Optimmune to my pet: Do not use Optimmune Ophthalmic if the pet has any type of infection in the eye(s). Tell your veterinarian if your pet is pregnant or lactating. Cautions: Do not touch the tube opening to any surface including eyes or hands. This medication may cause blurred vision. Avoid using other eye medications unless approved by the veterinarian. Nugget is on Optimmune for the rest of his life, and it is working great. Entirely Pets price for this product is so affordable, in my area it would cost between 50 to 60 dollars. My dog has to have this twice daily so I was glad to find a less expensive retailer. ConsTube sometimes has a lot of air in it. Great product! I have been using it for years for my dogs and had good results. Used to get it from the vet until I found Entirely pets. So much cheaper here. I love my vet but can be pricey. So thanks Entirely pets for having the best price in town. Quick delivery and a fair price. Better priced than my vet and free shipping was great! Last two orders (4 tubes) of this very important medicine squirted out and was wasted. We could not control it until more than half of the tubes were gone. Nothing I did made it better. We almost ran out because of this. Prior to last two orders there were no problems. ProsVery good at controlling the mucous in my dogs eyes. ConsPackaging problem must be fixed or I will have to find another medication. On next question, medication is awesome I just can't afford to pay the price and have half the medicine go on the floor and also deal with the possibility of running out. My experience with Entirely Pets has been great from the first time I ordered an item. I've ordered numerous times and the price is very good and the shipment is fast. Our dog is on this life long drug. We ran out of refills and Entirely Pets Pharmacy contacted the vet for refills with no delays. Best price we could find anywhere with fast service. The medication was priced right, and the seller obtained the vet's approval and shipped the medication in a very timely fashion. Everything was handled smoothly and professionally. You are always helpful if I have a problem. Thank you from Annie as it helps her eyes too. ProsI already said , save money for the same medicine .Very good. This company provides the same product at a very high discount. Need it for my dog's dry eyes. ConsSometimes hard to get in my dog's eyes. it was easy to order my dog, Annie's prescription thru you. I am grateful that it is cheaper too. She needs to use them 2x a day to help clear her eyes. Thank you. Have been using for about 10 months. ConsTube cracks and leaks ointment.